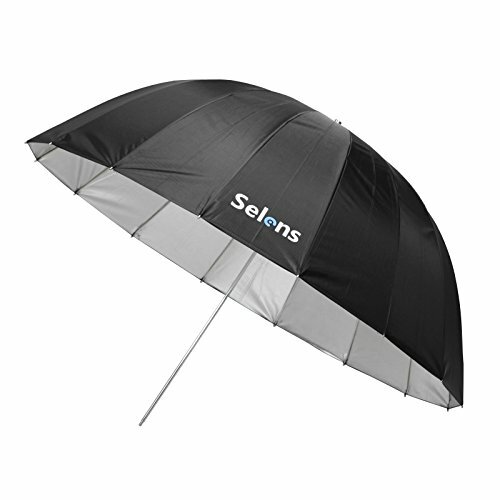 The 16-pod reflective umbrella from Selens is a unique heavy-duty, professional, reflective umbrella with a black exterior and silver interior for even distribution of light. The special shape of the umbrella helps wraps light around and get the crisp details by mixing the enveloping light. The umbrella also features a unique design that the 16 inner ribs are made of durable (fiberglass) and the fixed black backing ensures that all of the light output is on your subject instead of through the umbrella. You can also vary the light-to-umbrella distance along the shaft for a harder or softer light. Function: suit for Portrait photography, wedding photography, studio and etc.